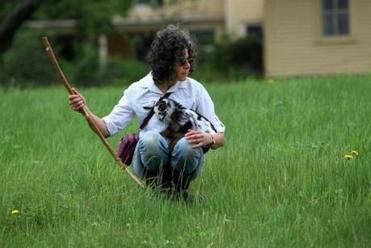 Halé and Melissa Hoffer go for a goat walk together to The Great Meadows in Concord. Hoffer&apos;s herd began from Hale&apos;s goats. When Halé Sofia Schatz takes her pets for a walk, she elicits a slightly unusual reaction. That’s because Schatz’s pets are not dogs, but a herd of friendly Nigerian goats. Schatz has raised goats in her backyard in Lexington Center for six years. She’s one of a small but growing number of Massachusetts suburbanites who are reclaiming the practice of sustainable backyard farming. Schatz is well known as an author and for the consulting and teaching work she does as a nourishment educator. She’s on leave from teaching this year, but she usually travels internationally to present seminars at colleges, corporations, and retreat centers, and to teach about sustainable food. She is the author of “If the Buddha Came to Dinner: How to Nourish Your Body to Awaken Your Spirit,” a book that explores her theories about the relationship between food and life. Schatz, who grew up in cities, said that as a food educator who values sustainable eating, she decided that raising goats in her backyard would give her access to a healthy source of food. From her goats, Schatz gets enough milk and cheese for her family and her friends. On this morning, Aegean, Minoa, Mei-Mei, Lycian, and Eia were sluggish in the heat, the adults languishing in the barn’s shade, and the kids tripping over each other to investigate the newcomer in their midst. Schatz scooped up Luna, the visitor, and embraced her, soothing the kid until she was calm enough to gallop across the yard and munch on a maple leaf. Schatz is one of three private residents licensed to keep goats in Lexington, according to Health Department assistant Linda Rainville. Schatz said she has found homes for her goats’ kids in town and in other communities. Concord resident Melissa Hoffer started her herd with two of Schatz’s goats in 2009, and now keeps 17. Hoffer echoed Schatz’s reasons for keeping the animals: she loves having a sustainable food supply, interacting with animals and nature, and seeing neighbors light up when they encounter goats frolicking on public lands. Joan Teebagy, a Belmont resident who already keeps chickens in her backyard, said she thought raising goats would be the logical next step. “I enjoy working with animals, I enjoy the challenge of it: they’re tricky, they have personalities. They’re milk goats and they have to be trained to be patient,” said Teebagy, who said she knows Schatz from the “goat community,” and bought one of her nourishment education books several years ago. Schatz, whose five goats live in a 9-by-12-foot pen attached to a barn with a milking shed, said that while she loves raising goats, keeping animals is a big commitment, and is not for everyone. Schatz said she and her fellow goat owners have learned to milk, trim hooves, and clean barns. She grows kale and collards for the goats to eat in the winter, and feeds them oak, pine, rose, and forsythia leaves. “You need to have a lot of commitment to what you’re doing,” Schatz said. But she also said that while goats have a negative reputation among some people as rambunctious animals that chew on anything, including trash, they are like many animals: If their human owners train them well, they will be friendly and well-behaved. “I’ve never had problems with them eating cans or anything,” Schatz said. For Schatz, it’s the reaction she gets that sums up the attraction of keeping these animals in her backyard. Emily Cataneo can be reached at emily.cataneo@ gmail.com.